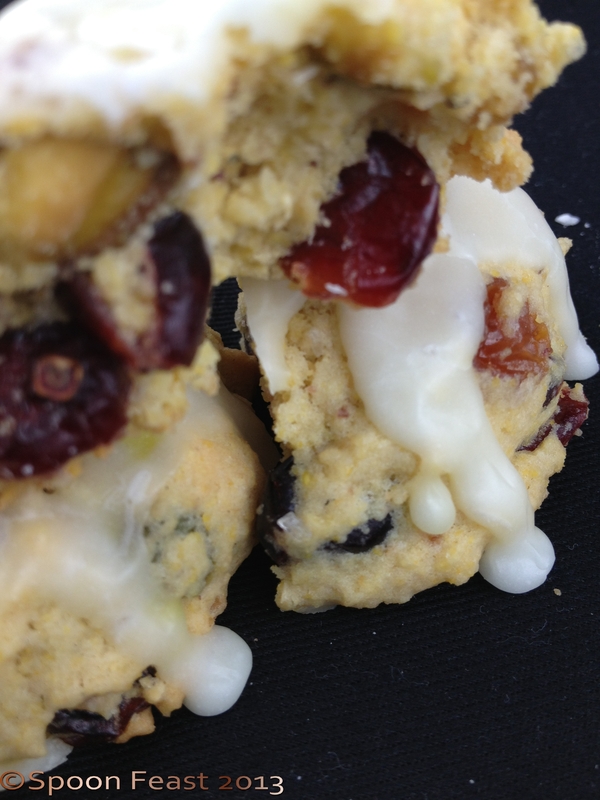 This is an unusual combination with cornmeal, pistachios and cranberries, but it works! These are more of an adult cookie because they really aren’t very sweet, just sweet enough. The touch of pistachio is a nice crunch, the chewy cranberries tart lime glaze create fantastic tastes and textures; these are addicting! Use lime juice as needed to make a drizzle consistency. Add it slowly as it does not take a lot to reach the consistency you want. Using a mixer with a paddle attachment, add the butter and sugars, beat until well combined. Add the eggs one at a time, incorporating each thoroughly before adding the next one. Scrape down the bowl, make sure nothing has been ‘forgotten’ on the bottom of the bowl. Add the dry ingredients next 1/3 at a time. As soon as the dry ingredients have been incorporated, add the dried cranberries and pistachios, stir just enough to combine it all together. Don’t mix it too much as you want a tender cookie. over-mixing causes them to get tough, not steak tough, but tough for a cookie. You can chill the dough at this point and bake the cookies off later. the dough keeps very well, freezes well too. or scoop it out and bake the cookies at 350°F for about 12 minutes. The cookies are done when they have a light golden brown edge along the bottom of the cookie. The tops will still be a bit soft, that’s what you want. Remove the cookies from the oven, allow them to cool for 5 minutes on the baking sheet before moving them to a rack to finish cooling. Place the parchment paper from the baking sheet under the rack. It will catch the lime glaze as you drizzle it over the cookies. Make the glaze and drizzle it over the cookies. Let the glaze dry before storing the cookies. I like to store these under a glass dome. it keeps them from becoming too soft or too hard and they are quite nice to look at too. 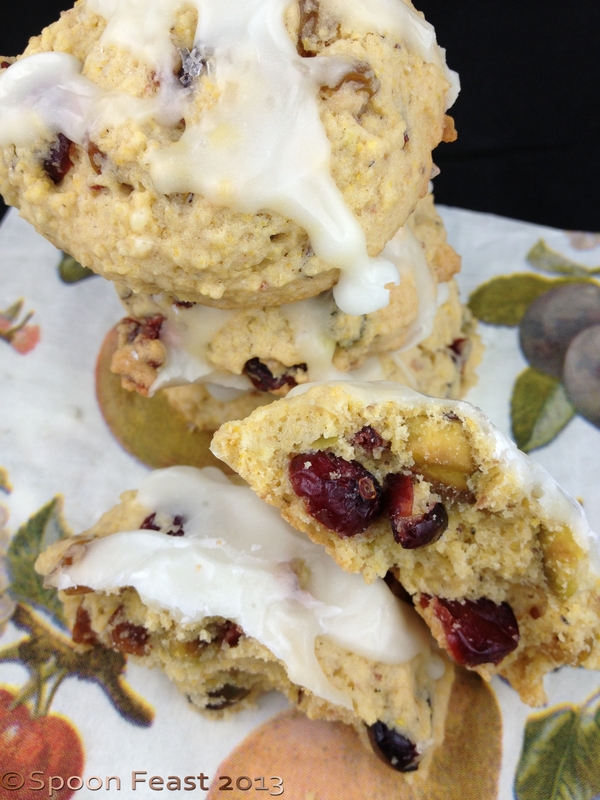 The glistening cranberries, wink of green from the pistachio and the crumble of the cornmeal makes for a real treat. 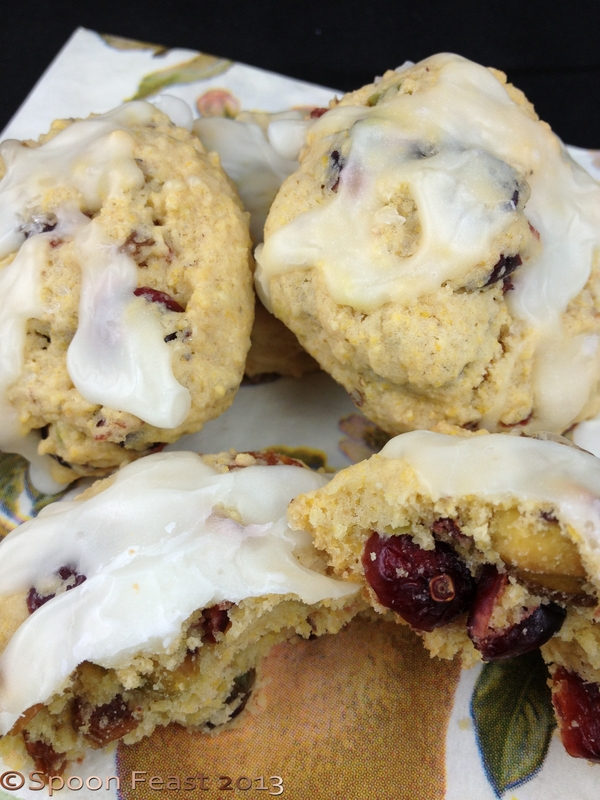 This entry was posted in Recipes and tagged Cornmeal, Dried cranberry, lime glaze, Pistachio, tart lime, yellow corn meal. Bookmark the permalink. These look perfect for a high tea or brunch. I love to sip tea or coffee with them. Either seems to be a perfect match! Great photos. Make me want to try these. Of course, I like lime with just about anything but this sounds like a perfect combo – tartness of lime and cranberry with the sweetness of the icing…. I cannot wait to try these, they look delicious!